Someone stole my old YT channel... EDIT: Deleted? Problem is, it would appear that there isn't really anything I can do about it. I don't remember neither the email that the channel is attached to, nor the recovery email or phone number that it's supposed to use. Supposedly, there used to be a link with which you could try to claim your pre-Google YT channels ( www.youtube.com/gaia_link ), but it does not seem to be working anymore. EDIT: I don't know how, but I just checked up again on that old channel and saw, to my utmost surprise, that it's now deleted? Considering that this is what I planned to do with it anyways if I managed to get back my access to it, I think I can call it a happy end. I don't know if it's because someone here reported the channel or if it's because the thief himself decided to delete it, but I didn't have anything noteworthy on there anyways, so I'm glad it happened. I can only accept payments in USD, and only through PayPal. This unfortunately means no DeviantArt points, sorry. 2. I ask about a few things if something is unclear, and then confirm that I accept the commission once I know everything I need to know. 3. I make a rough preview version (which is usually lineart like this). 4. If you think you like it, then you send the payment at this point. If you feel that something is not the way you want, then you can request some changes and send the payment once you're satisfied with the changes. 5. Once the payment is received, I finish and colour the image, and then send it to you. No more than 6 full-body characters per artwork. I am not capable of working on the same piece for longer periods of time, and a higher character count means more time necessary to finish the artwork. I do NSFW too. Feel free to ask for details through private messages. I do OCs too, but only pony/changeling and animatronic ones, or anything that is pony-like enough. I do not work with realistic-looking animals or creatures that have realistic-looking hands. The only potential exceptions are Spike, Discord, the MLP main characters' pets, and some simple creatures (like bugs and birds). I do not offer humanized or anthro characters at the time, sorry. - Roid Rage (the YEAAAAH pony). - Basically anything very complex, like very detailed armors, crazy weather effects, a whole lot of various different objects scattered around, and stuff. If anything feels unclear, just ask me a question. I won't bite. Well, I think it's time to get back into the swing of things. I apologize for not being able to do this earlier, but there's been various things I needed to take care of first. I'm still saving for a new PC, so anyone willing to commission me is greatly appreciated. Feel free to ask me about comics. They cannot be longer than 3 panels, however. Price can be discussed. So, it's been a while since the last journal. As you can see, things have gotten a little better in that I'm still occasionally posting new pictures, though it kinda comes and goes. I'm still dealing with usually not having the motivation to draw, but I feel I've been doing better in that regard lately (though a good chunk of it is non-pony stuff for a certain project, so I can't post them here). And that's just the most noticeable issues. 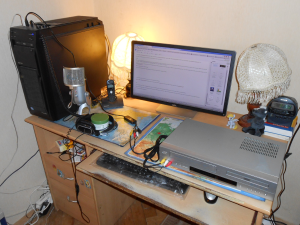 What I would like to replace it with would be a good quality gaming laptop from either Lenovo or Saelic. There are times where I end up travelling somewhere, so having a laptop as opposed to a stationary computer would not only allow me to keep all of my important files and programs with me at all times, but it would also just be very convenient to have a computer that can be easily moved with little fiddling. Laptops tends to work much quieter than PCs, which is invaluable when it comes to recording my voice with a microphone. Unfortunately, this adds up to a considerable sum. Which is why I'm asking for help. If you can spare any funds, then any amount is greatly appreciated. For now I've set up a donation button on my deviantArt page, and I'm wondering about other ways to gather money. I'm considering opening commissions again, although, is there even still any interest in those? If you have any advice or suggestions, that would be much appreciated as well. So you might have noticed that I haven't been active here at all lately. The reason for this is that most of the time, I don't have motivation for anything. 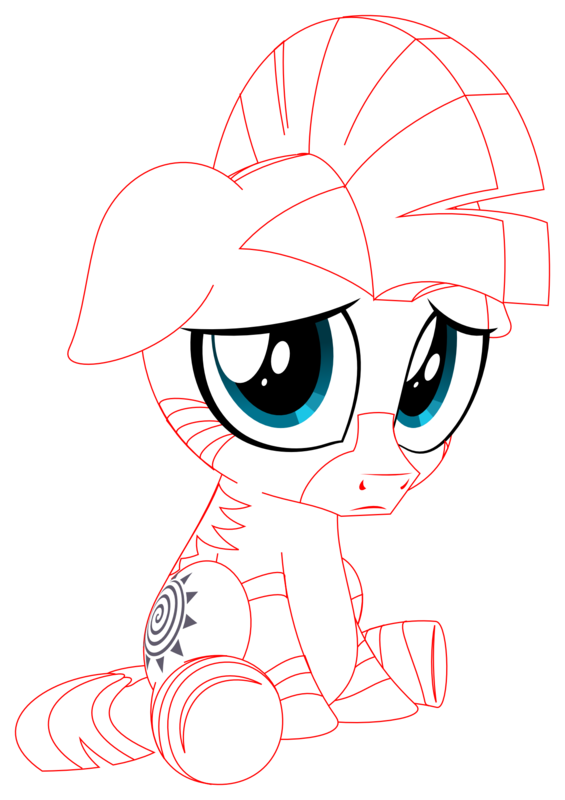 Nowadays, I rarely can bring myself to draw anything, and I almost never feel like drawing pony. And when I do, it usually ends up being just some random crap that I don't even bother uploading here and instead dump onto my Derpibooru account. It has gotten so bad that I can't even bring myself to do these few commission requests I have gathered. I think at this point I have to just cancel any commissions that I have not yet worked on - deepest apologies to anyone who is affected by this. The last, well, year pretty much has not been good for me in terms of productivity. I don't think I've done anything of note these past 6 months. 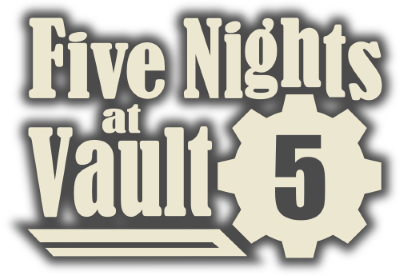 The last time I exhibited any kind of excitement and willingness to work hard was when I worked on the anniversary edition of my Five Nights at Vault 5 mod for Fallout: New Vegas - and the said anniversary edition has seldom gotten any response to it, crushing my spirits all the more. Once there was nothing more to work on in that mod, I was left with nothing to do. I just kept wasting time, thinking about me wanting to do SOMETHING, especially a game in GameMaker, but every time I was either stopping at the stage of vaguely thinking about it, or if I actually tried to start working on it, then any incentive to do so always evaporated the moment I looked at the open GameMaker and considered the amount of things I'd have to do and/or learn in order to make anything. And my overall mood certainly wasn't helped by my 10 year old cat, rest his soul, leaving this mortal coil one week before my birthday. The good news is that I managed to find a new cat right on the day of my birthday. And eventually we decided to get one more, since I learned from reading things on the Internet that it's better to have two cats, since they aren't as lonely. It's working out pretty well, even if they tend to be troublemakers. Also, about half a year ago I found a job, and I still have it. I sit at home and test whether websites work as intended. It's a decent job, even if I don't find it not nearly as engaging as testing games. I have a source of income, so everything's fine on that end. Other than that, I discovered the joys of mobile gaming, and have been happily playing Rayman Fiesta Run and Puzzle Quest 2 when on the bus or something. Speaking of the latter, ho boy, the game is ridiculously prone to crashing, and the last two dungeons just keep going on forever, courtesy of excessively long battles with enemies. Thoughts like that made me consider trying to start a game review channel on YouTube, but when I considered the amount of work required, such as the need to record everything, plan everything, and to take notes as you go, the idea fizzled out as well. But anyways, this newfound interest in mobile games made me invest in a tablet (Acer Iconia Tab 8). It seems to work well, and I hope to get to play the soon-to-be-released Planescape: Torment for Android. Oh, and at some point I ended up making an Android version of my Asteroids clone. So there's that, I guess. I think I'm gonna end this here, because I don't really have anything else to talk about. I guess I just wanted to say... something. Give some signal that I'm still alive. Even if I'm not sure why. I can only accept payments in USD, and only through PayPal. DeviantArt points are out of the question, sorry. - I ask about a few things if something is unclear, and then confirm that I accept the commission once I know everything I need to know. - I make a rough preview version (which is usually lineart like this). - If you think you like it, then you send the payment at this point. If you feel that something is not the way you want, then you can request some changes and send the payment once you're satisfied with the changes. - Once the payment is received, I finish and colour the image, and then send it to you. Both before and after I finish the image you are able to request some changes, and there's always room for discussion. I do OCs too, but only pony/changeling and animatronic ones, or anything that is pony-like enough. I do not work with realistic-looking animals or creatures that have realistic-looking hands. The only potential exceptions are Spike, Discord, the MLP main characters' pets and some simple creatures, like bugs and birds. Before you ask, no, I wasn't planning to post this on my birthday, it just kinda fell together at the same time. MANY thanks to everyone who sent me wishes! You are all awesome. Hello everyone! If you were wondering what I've been doing recently, then here is your answer: I've been working on a mod that attempts to bring the general concept of Five Nights at Freddy's into the Fallout universe, on the engine of Fallout: New Vegas. The mod is fully voiced (thanks to the wonderful guys at voiceacting.proboards.com/ ), contains all five nights, features five robots, and has a fully customizable Custom Night. But its most important feature is that this time, you aren't stuck in a single place. Now you have to MOVE. In this mod, you come across an abandoned Vault, in which you find a fully functioning Arena. In this Arena, which was Vault-Tec's ill-conceived attempt at creating a survival training program, you have to spend 5 nights trying to survive in a small, enclosed environment, with an explosive collar on your neck and no means of defense against deadly robots; robots who can, and WILL, chase you and kill you on contact if they see you. You must prove to be the master of hide and seek if you want to avoid dying from your head exploding, or from being irradiated to death by machinery devised by madmen. Are you man enough to face the dangers of the Arena and come out victorious? The creation of the mod was inspired by me feeling dissatisfied with the gameplay provided by FNAF4; from the trailer, I got the impression that the game is going to be about you having to sneak around the house and avoid deadly animatronics until 6 AM. I was really eager to see such an amazing twist on the formula; however, what we got instead was just the same old schtick of you being stuck in the same room, constantly checking the doors. Feeling upset over this letdown, I decided to try finding a way to make such gameplay myself. After a streak of not having much luck with gamemaking programs, I finally got the Eureka moment: making it a mod for Fallout New Vegas. I've been already modding in Oblivion and Fallout before, so it shouldn't be impossible, I thought. Well... not impossible, but very time-consuming and extremely frustrating. 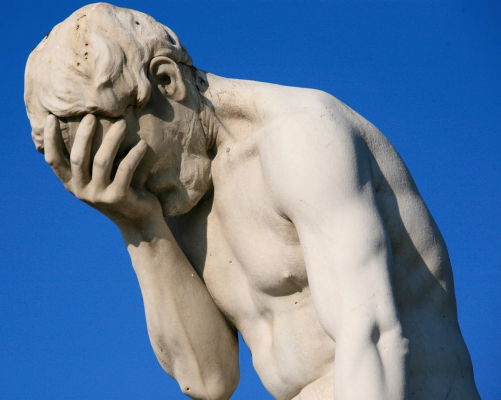 I swear, I've been encountering errors or problems on every single step, and nearly everything that seemed like a simple thing to do has proven itself to be a problem that took at least an hour or two from my life making me try to figure out what the hell am I doing wrong. Probably one of the must infuriating parts was that, for some reason, the editor does not show any error messages when you make an error in a script and instead just keeps asking "Do you want to close without saving?" every time you save and try to close the script. I was forced to constantly keep bringing up the editor from Bethesda's first Fallout (in which error messages worked) to painstakingly recreate the object references in a test location, just so I could test the script and see where the error is. And don't even get me started on problems with edited or custom models and in the scripts themselves (if they were functioning enough for the editor to let me save them). And the worst part was, I had to figure out every single problem for myself. If I couldn't find it with Google, then the problem just wasn't going to be solved unless I stumbled upon the solution by myself. There wasn't any point to leaving any questions anywhere, because if there's something I have learned from my modding days, it's that the community simply isn't going to help you with anything more complex. If it isn't anything basic, like "how do I make a quest" or "how do I make picking up an item cause a quest update", then nobody is going to answer your question, because they either don't know, or don't care. But on the other hand, now I can at least claim that it's all my work alone, save for other people's resources and the voices from voice actors. If you have any questions or bug reports, please let me know. I accept payments in money only (preferably in USD), which means NO deviantArt points. Also, I can only accept transactions through PayPal. - I finish and colour the image, and then I send it to you. For those who don't know what this is about: In case you didn't notice, dA did some notable changes in the site's UI yesterday. While most of them don't bother me that much, what pissed me off was that for some completely incomprehensible reason, the Messages thingy at the top was moved from the center to the top-right corner. I found this extremely un-intuitive and really ruining my experience on the site (considering that I come here quite often to check for new messages), but thankfully, a kind soul named Portal15Art introduced me to the script linked above, which fixes the entire problem (thank you once again!). If you too are bothered by this change, then I highly recommend using it. On a side note, I wanted to give my belated thanks to everyone who gave me birthday wishes on 13th. You are awesome, guys! Free of charge (only as an addition to a commission though), unless you expect me to somehow improve it with flying objects or something like that, in which case the price may vary. Please note that I no longer offer detailed backgrounds, only ones like these below. I accept payments in money only (preferably in USD), which means NO deviantArt points. Also, I can only accept transactions done through PayPal. - I finish and colour the image, and then send it to you. I do OCs too, but only pony or changeling ones, or anything that is pony-like enough (see below). I do not offer humanized or anthro ponies at the time, sorry. If you remember that recent journal entry of mine that was only in Polish, then now you can learn what the whole thing was about. 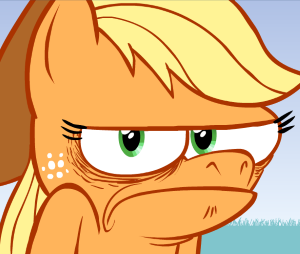 Before you start reading: no, this isn't pony-related, aside of a few reaction images. So, here's a funny little story about an "adventure" I had during the last 2 months. Be warned, it's a little lengthy. Also, occasional swearing. Mind you, that was a completely different movie altogether, but something in The Magic Voyage's style reminded me of a certain animated movie that I last saw 12 years ago, maybe even more. Eventually, I decided to try and find out what it was. At first, I was thinking that my copy of this movie might actually still be somewhere (assuming that I actually owned it, instead of having it borrowed from someone). Due to the fact that as far as I know, all of our old VHS cassettes were given away to my father, I decided to visit him one day and search for the movie. We probably spent an hour digging out boxes that contained the cassettes and then looking over their contents; I looked at every single VHS in there, but nope - it wasn't there. The movie is most likely from 70s-90s era. Does that remind you of anything? I'm not surprised if it doesn't. Scroll down a little if you want to continue reading and learn what it was. The Legend of the North Wind. When I started watching it, something seemed familiar about it, but I wasn't sure. It wasn't until 0:42 when I finally went "YES! THIS IS IT! ", since the scene where one of the kids holds that oil lamp was one of the things that I remembered rather clearly. Man, was I joyful at that moment. However, this joy diminished quite a bit when I learned that the movie is simply nowhere to be found on the Internet. Nobody bothered to make it, akhem, available for free, and the only way of buying it was ordering a VHS cassette all the way from the US. Even if I was willing to actually buy this cassette, I didn't even have a VCR (a device that reads VHS cassettes). That was a little bit of a problem. I looked around and I learned that there are companies that offer converting VHS cassettes to DVD for a small price. Overjoyed again, I went ahead and ordered the VHS. 20$, including shipping. I just couldn't wait, and the fact that it would take 11+ days before it arrived was just killing me. Joyful, I was getting ready to go to one of those companies to get the cassette converted, and I phoned my dad (since at this point he was curious about the movie as well) to tell him the good news, but then he told me something that I didn't think of: namely, that I should phone this company before I'll go there and ask if they do convert copyrighted movies. So I phoned there and guess what they said? That indeed they don't. I asked my mother if she couldn't ask her friends if there isn't anybody out there who could do that as a favor, but no such luck. Eventually, I realized that if I want to see that goddamn movie, I have to do it the hard way. This meant that I had to get a VCR. And a cable and software that converts VHS to DVD. At first, it seemed that I will only need the latter; my dad said that he did have a VCR himself, and was willing to let me borrow it - he just needed to give it to some company for cleaning up, since it was dusty and stuff (or something). 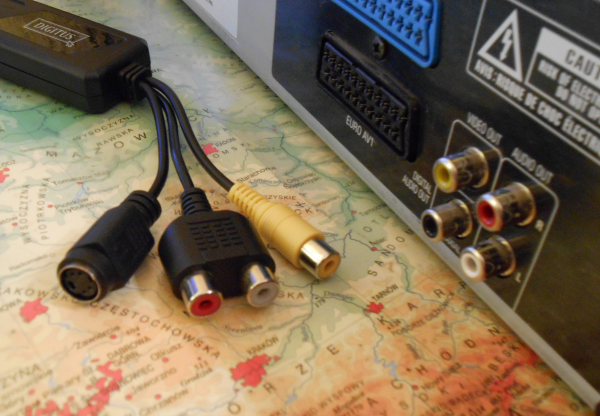 As for the cable, I was initially getting ready to buy it through the Internet, but then dad suggested to try looking for it on a bazaar. And wouldn't you know it, there indeed was one, and for less than the ones I found on the net: 100zł (roughly 33$). But guess what? It wasn't so simple. It turned out that, shortly saying, something inside was broken and it would cost way more than it's worth to have an expert to look it over, not to mention buying replacement parts. Basically, I needed to buy a VCR as well. Dangit. 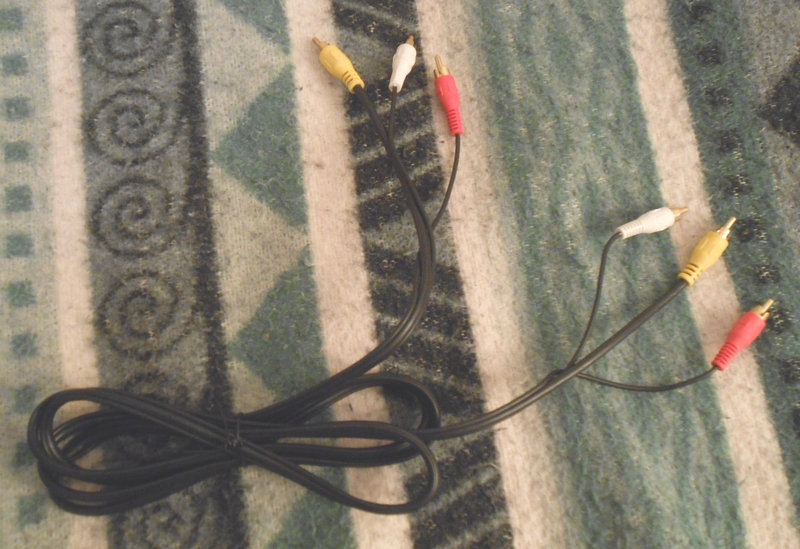 They made a cable meant specifically for attaching it to a VCR and THE CABLES ARE ALL MOTHERF***ING SOCKETS?! First, the VCR wasn't being detected by my PC, despite the software being installed. I had to leave a question on a forum dedicated to such endeavors, hoping that somebody would find an answer to this conundrum. While I was waiting for an answer, I decided to just go "screw it" and simply watch the movie on my TV before converting it. I hooked it up to the TV. First, I put in a VHS of The Polar Express, which my dad gave me to test the program. THANKFULLY, the VCR worked just fine - I was afraid at this point that the universe would decide to give me a middle finger here. But no. It simply waited a moment longer. ...and it turned out that this was actually a VHS of some documentary on Alaska. OH MY GOD, IT F***ING WORKED. The test of The Polar Express went splendidly. Okay, maybe not splendidly, since there was some minor issue with the sound (it being more on the left ear than the right), but it still worked. I captured the content of a VHS on a computer file! 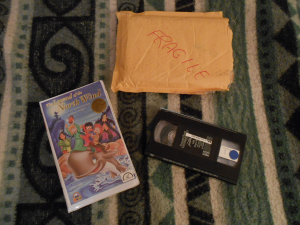 First, there was a problem with the place where I found another copy of the VHS: the guy told me that he ships stuff only to USA (since, you know, USA is obviously the only country in the entire goddamn world), and he only told me that AFTER I sent him the payment. And he didn't send it back despite me asking for it, meaning that I lost 7.50$ in the process. Nice. Then I found another copy on Amazon, which had two problems: no PayPal (seriously?!) and again no shipping outside USA. It seemed that the only way around it was to use a certain roundabout route... I asked my friend masemj to first order it to himself, and then to send it over to me once it arrives. When it did, he took a look inside to make sure that the cassette does contain the correct movie this time. Heck, he even had a VCR to check the contents. Yes, this indeed was it. From there, he sent it to me and I paid for the expenses. Oh, and I even found the sequel! It's called "The Return of the North Wind". I figured that if I'm going through all this trouble for the first movie, then I can as well get the second one too and have a complete collection. We repeated the process here. In the meantime, I decided to make some more use of the stuff I bought and try to convert the old VHS cassettes my dad has. A full bag of 'em. As it turned out, "Honestech VHS to DVD" program wasn't working as splendidly as I initially thought. Oh, and it wasn't just the kind of crashing where you can simply terminate the process with the Task Manager and try again. Nooo, when THIS program hangs itself, it takes the entire computer with it, refusing to terminate itself and causing other programs to crash (which refuse to terminate as well). I had to use the reset button on my computer for the first time in I don't know how long. And I had to do it several times over the course of two days. And as if THAT wasn't enough, these resets apparently caused my Rayman Legends saves to be wiped out. WONDER-F***ING-FUL. At least I didn't lose my progress in the Challenges (especially the one Diamond Trophy I managed to win), because otherwise I would have hanged myself right then and there. With me not wanting to mess anymore with the converting process, since I was afraid of more crashes happening and the potential danger of the VCR breaking down from overuse, I decided to wait with everything until I got the damn movie and had it finally converted. 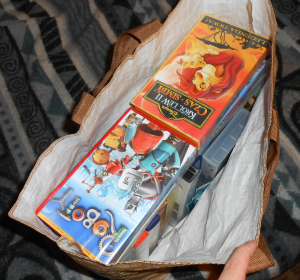 I did eventually convert the Toy Story 2 though, at the very least. Speaking of which, there's an interesting thing I noticed: the VHS cassettes not only had Polish dubbing, but also had some of the texts visible on the screen translated into Polish. For example, remember that black ball from Toy Story, the one that Woody shakes in order to know if he's going to be chosen by Andy? In the Polish VHS cassette, the text "Don't count on it" is translated ("Nie licz na to") - as in, they actually changed the texture of the 3D object. In the DVD release of the movie, all of the text remains English and the only thing that is changed are the voices. This is presumably because there wouldn't be enough space on the DVD to put in different versions of the movie where the texts are altered. A damn shame, if you ask me. Anyway, the fate still kept mocking me, since the delivery didn't seem to be arriving. It was said to arrive during the next 6-10 working days after being sent. The time was passing and we were starting to get worried; it wasn't until the final, 10th day that it FINALLY arrived, somewhere past 12AM (couriers usually arrive before that hour) and me already losing hope. I looked inside and there it was, the cassette I was searching for this entire time. "Let's get this show on the road", I thought. My initial intention was to first convert it right away, and watch it only after I had the damn thing finally on my computer. Buuuut guess what? 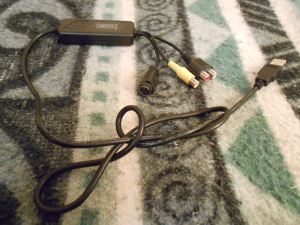 I put it in the VCR (after hooking it up to the PC, of course) and for some reason, the program was choking up on it. And by "choking" I mean it wasn't registering that any cassette is in the VCR at all, beyond a brief flicker of a single frame from the movie. At first I thought, "Oh god, don't you DARE telling me that the VCR just randomly broke!". But after checking some other cassettes to see if they have the same problem, it turned out that nope, the problem was with the movie itself. B) The cassette uses some weird PAL60 format that not many devices out there can decode. And no matter which possibility is true, if I wanted to bypass this problem, I would have to dish out about 200$ for a device that might do the trick. Or not, in which case I would end up spending all that money for nothing. ...I wasn't even angry at this point. I just felt defeated and tired of all that bullsh*t.
It was then that I decided to just screw it all, watch the movie, and then simply move on, it being saved on my computer or not. I kept watching... and I was just confused. NONE of this imagery sparked anything in my memory. I kept watching, thinking that maybe something will click later on, but nope. I finished watching the movie not only being 100% certain that it wasn't the film I was looking for, but also concluding that it was a lame, messily done piece of unnecessarily convoluted and plain boring story, with deranged, confused animation to boot. 2/10 would not watch again. Although this impression was probably strengthened by the fact that I couldn't understand half of what they were saying. Since, you know, I'm not that good in understanding English from hearing. But that's not going to tell you anything substantial about the movie, is it? You spent your time reading all this, so the least I can do is explain what the story was about, even if I can't get the actual film onto the Internet. As best as I can follow the story: There is this bad guy who I think hunts whales and knows the legend of a hidden bay filled with hundreds of them. He doesn't, however, know where the bay is, but luckily he found out that a certain cook in the same city knows how to find the bay. Or to be more specific, this cook knows the location of an Indian/Inuit tribe (I don't really know) who protects a magical vase in which the titular North Wind is sealed, an evil spirit that once wanted to freeze the world, but the ancestors managed to seal him in the vase, and have since created a pact to protect it. And for some reason, this magical vase can also show the way to the whale bay. What does the North Wind have to do with whales, I have no flippin' idea. Anyway, the bad guy knows that the cook works on a ship that is going to travel to the aforementioned Indian tribe, and it will depart from the port on the same day. Thus, the bad guy wants to pass off as a scientist and join the crew to get aboard. He also gets help from a pirate named Barnabe (whom everyone keeps calling Barnacle), whose task at first is to follow the ship at night with his own ship, presumably so that the bad guy can use his ship later on. Or something. I don't really know. Anyway, Barnabe points out that he can't follow the ship at night, but the bad guy comes up with the idea to use some special spheres that start glowing when thrown into water, so that Barnabe can see it and follow them. Did I mention the kids yet? Yes, two of the three kids show up at the beginning, delivering barrels with some wine or something to the ship. There is this conflict where the boy gets to join the crew during the journey, while the girl has to stay behind because she's, well, a girl. The girl is upset, and after loads of padding, she sneaks up onto the ship and ultimately gets to join the journey without anybody noticing. From there, the majority of the movie is about the girl, and later the boy, trying to thwart the plans of the bad guy while on the ship. Also the third kid, an Indian boy, gets introduced later on, something about him needing to hunt down a bear to pass a rite of passage or something, but failing at it. The bad guy's plan is to first add some powder to the wine to make everyone fall asleep, then steal the vase, and use it to get to the bay. Meanwhile some stuff happens that I don't quite remember, and the kids get stranded in some cave where they finally get to meet each other (the first two with the Indian boy). Also, the white boy gets a temporary amnesia or something where he acts braver than usual (he's normally a coward). The fact that he got an amnesia isn't explained at all, resulting in you being completely confused by this sudden change of his character until he snaps out of it after he bumps into something. Then a baby whale that they met earlier saves them, they discover the bad guy already putting his plan into motion, they follow him into the bay, and they defeat him. With a rabid cow that was shown earlier on the ship. Then they are all treated as heroes, they put the vase back where it was, and they become descendants of the pact. The end. Needless to say, it's overly convoluted, the pacing is bad, and overall it's just freaking BORING. Hell, maybe even Nostalgia Critic could make a review on it if he got his hands on it. Okay, but back to the fact that this wasn't the movie I was looking for at all. So, what the hell happened here? This was it. THIS was the thing I was looking for this entire time! I knew this was it, because I recognized that cover immediately. It was like a minor Holy Grail. And guess what? This cover meant that this movie actually got a Polish dubbing, whereas I kept thinking all this time that as a kid, I watched it in English, with it only having a Polish lector (a single male voice actor who reads all the lines, a common practice in Poland). This, of course, meant one thing: I had to get my hand on a Polish copy of this movie. The reason being that even if I had the English version, it was the Polish one that I was truly nostalgic about. Anyway, the following part actually happened today. I started writing this journal a month ago, since this entire ordeal took such ridiculous amounts of time, money and effort that I thought I might as well write everything down and post it here for the curious. I might come back to it one day to laugh at myself for doing all this crap. Anyway. As I was getting ready to go visit my dad again, I was surprised by the sound of our doorbell. After the way the previous cassette was delivered at the last minute, I was expecting this situation to repeat also for the second one. So imagine my surprise when I actually found a courier standing at my door with the delivery I awaited, two days before I expected it to arrive. Oh the happy moment. When I came back from my dad, I didn't even bother hooking up the VCR to the PC, since knowing my luck, the cassette had the same problem as the first one (guess what, it did). I just put it into the VCR while it was already attached to TV, and I simply started watching. This was it. I remembered everything from the very first scenes. And it was awesome. Well... at least at first. First, the (English) voice acting. I don't know if the creators were forced to rush things for some reason, but when the VAs say anything longer, they tend to do it without pauses, jumping from sentence to sentence at unnatural speed, which is pretty distracting. Second, the story is rather cliche; I'll get to that in a moment. Third, while the animation is better, it still feels a bit odd at times, and the movie has an annoying tendency to reuse certain animated segments, which is really cheap; also, the mouth movement often doesn't match with what the characters are saying. Fourth, while the pacing is better than in the first movie, it still doesn't work in certain places. And fifth, the movie doesn't seem to have a proper ending, or epilogue to be exact, which is disappointing. Okay, so what's the story? In the previous movie, the bad guy was captured by the Indians and kept hostage by them. One day he escapes when the guards are both asleep on the job (brilliant work there, guys) and he decides to once again steal the vase. This time he intends to invoke revenge on everyone by fueling himself with the North Wind's power. However, this backfires and the North Wind possesses his body, completely overtaking him. North Wind then goes to search for a hideout and ends up in a cave. He decides to stay there until he can regain his power, at the same time realizing that he will need to find a way to somehow break the vase, which apparently keeps holding back his powers. Since the vase can be broken only by a descendant of the pact, he concludes that he must force one of the three kids to do it. He goes off to once again get help of the pirate Barnabe. The nightmare starts out with their father urging them to blow out the still burning oil lamp in their bedroom; it was established in the scene before that their father doesn't like them leaving it on. However, the girl catches on and figures out that this isn't actually their father, but the North Wind instead. They somehow get teleported inside a ship sailed next to the Indian village; everything is frozen there, and the lamp is both their only source of warmth and the only protection from the North Wind. From there, wow, lots of things happen, but in general, they have to keep fleeing from the North Wind and outsmarting him until finally they manage to defeat him by getting him caught in the middle of a circle of fire. However, this was only a victory in the dreamworld; in the real world, the North Wind is still on the loose, and he's causing a snowstorm on their city. He then freezes over their father and kidnaps the Indian boy. Back in his evil lair, the North Wind tries to convince the boy to break the vase, but to no avail. Meanwhile, the two other kids try to run after him, bringing a whole cart of barrels of oil with them. They attempt to seek help of the goddess of the sea, and she points them in the right direction before being blown up by Barnabe and his explosive bottles. In the lair, the kids try to deploy their plan, but are stopped by Barnabe who messes it up. From there, kinda sorta fight happens between the kids and the North Wind, and then they manage to set the barrels on fire and defeat him. The end. And this is it. The movie I was looking for this entire time. How does it hold up? Well... it's very rough around the edges, it's rather cliche, and all those problems I mentioned plus the fact that many scenes are unintentionally cheesy in various moments (TVTropes would call in Narm) makes it a fairly mediocre movie with a semi-interesting premise and some amounts of good atmosphere. I can see why it's so obscure these days: there isn't much in it that could make it truly memorable. Probably the only reason I remembered it so fondly all these days later is that a child's mind exaggerates the good things and filters out the bad things, leaving only the good ones. But you know what? I don't regret going through all that trouble to see this movie again. It was still nice to see it again and I genuinely enjoyed the experience. It was certainly very interesting to compare my memories of it to how it actually is. And I learned a few things in the process, as well as becoming capable of converting VHS cassettes to computer files, which is unique and pretty handy. That said, I am not going to bother buying that device I mentioned earlier just for this movie. It's not worth it. Besides, what I really would like to be able to do is converting the VHS cassette with the Polish version of the movie. This cassette is in PAL format (European) instead of NTSC (Worldwide I guess? ), which means that probably it wouldn't have any protections or anything like that to stop me. I know because the cover I linked above stated clearly that it's in PAL. But alas, unless through some freaky streak of luck I come across it or someone offers to sell it to me, this just isn't going to happen. Which is sad. But I still end this story on a happy note. I'm glad I could see the movie again, and while I wish I was able to get my hands on the Polish version and convert it, the world isn't going to end if I don't. I got rid of that nostalgia itch that was bothering me for quite some time, and that's all I really wanted. One day I randomly reminded myself about an old movie I saw as a kid. I tried searching for it in my house and dad's. No luck. I tried asking people on TVTropes if they can figure out its name based on how I remember it. Two weeks later, bam: "The Legend of the North Wind" is the name. Nowhere to be found on the Internet. I decide to buy the VHS cassette from USA, thinking that I can give it to a special company to convert it to a computer file. Then I learn that they can't, because copyright. Tableflip. 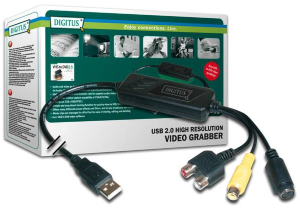 I buy a device that can attach a VCR (a machine that reads VHS cassettes) to a PC. Then I learn dad's VCR is dead. I buy my own VCR. Then I learn I need a cable that will connect the VCR to the device. I buy the cables. Then the program I bought along with the device doesn't work for some reason. I ask on a forum. Meanwhile, I go watch the movie on the TV with the VCR. Turns out the cassette was actually some documentary on Alaska. Tableflip. From the forum I learn that I forgot to install the drivers. Whoopsie. Now it works, yay. I order another copy from USA. The guy scammed me. Then I try searching for another one. I find it, but the dude doesn't ship outside USA, because what the hell is Europe. I ask a friend to first buy it and get it, and then send it over to me. 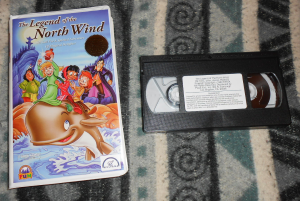 I also find the sequel, "Return of the North Wind". We do the aforementioned thing for both. The first movie takes an eternity to arrive. Then I try to convert it to a computer file. Doesn't work. I ask on a forum. Turns out I'd need a ridiculously expensive device just for this movie alone. F*ck that sh*t. I just watch it on TV. It's not what I was looking for at all. Also, it's a lame movie, 2/10 would not watch again. Then I look it up, and I learn that what I was actually looking for was the Polish dubbing version of the sequel. But the Polish one is nowhere to be bought. Sadface. Then the English sequel arrives. I watch it. It's better and arguably decent, but has its problems and isn't anything special. I still liked it though, because nostalgia. Thus, I regret nothing. I just wish I had the Polish version though. I could probably convert it without problems, too. Oh well. Nie wiem gdzie mógłbym się o to zapytać żeby dostać jakąś odpowiedź, więc spróbuję tutaj. Mam na kasecie VHS pewien stary, mało znany film animowany, którego nie można już kupić w sklepach, a nie został on wydany na DVD. Potrzebuję przegrać go na DVD - chciałem z tym pójść do ludzi, którzy zajmują się czymś takim, ale dowiedziałem się, że nie mogą tego zrobić z filmami objętymi prawami autorskimi. Moje pytanie brzmi: czy jest w Warszawie ktoś do kogo mógłbym się ewentualnie wybrać z tym filmem do przegrania? Bardzo mi na tym zależy, więc doceniłbym jakąkolwiek pomoc. Free of charge (only as an addition to a commission though), unless you expect me to somehow improve it with flying objects or something like that, in which case the price may vary. Please note that I no longer offer detailed backgrounds, only the ones like these below. Payments are accepted in money only (preferably in USD) - NO deviantArt points. The transactions will be done through PayPal. - I finish and colour the image. Of course, both before and after I finish the image you will be able to request some changes, and there's always room for discussion. No more than 6 full-body characters per artwork. I'm not capable of working on the same piece for longer periods of time, and a higher character count means more time necessary to finish the artwork. I do NSFW too. Feel free to ask for details through notes.